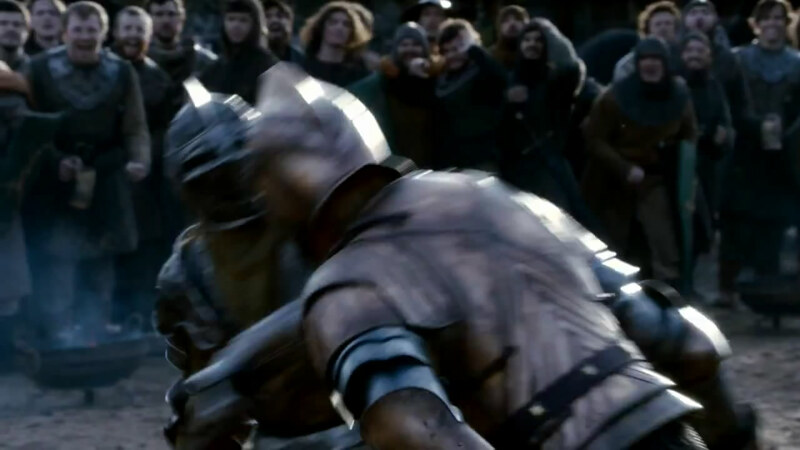 Ser Loras Tyrell fighting a foot combat with Brienne… or some other member of Renly’s guard? The armor is clearly the same as what Brienne and others of the guard wear, in any case, but in the book Brienne is not yet a guard. Again, in the novel, this happens at the end of a very large mounted melee… but budget, time, etc. I do like the fact that he seems to be using a double-handed weapon, perhaps an axe, hard to say (in the book, Loras uses a longaxe). We hope that the fight falls out more or less the same way as it did in the book, horses aside, though—it says a lot about both of them in the way that a more conventional fight scene probably wouldn’t. We’ve glimpsed this in a behind the scenes image, as well.